In an underground city in a dystopian future, the protagonist, whose name is "THX 1138 4EB", is shown running through passageways and enclosed spaces. It is soon discovered that THX is escaping his community. The government uses computers and cameras to track down THX and attempt to stop him; however, they fail. He escapes by breaking through a door and runs off into the sunset. The government sends their condolences to YYO 7117, THX's mate, claiming that THX has destroyed himself. 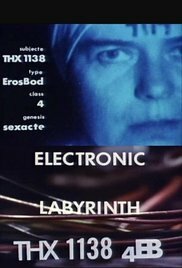 Electronic Labyrinth: THX-1138 4EB is a 1967 science fiction short film written and directed by George Lucas while he attended the University of Southern California's film school.